Converting units of weight can be a solution to a number of problems. From delivering packages to different countries to solving more complex math problems, this template makes the process quick and effortless on your part. This is especially useful for small businesses that find themselves having to convert weight for a number of different reasons. This document is fast, easy to use, and best of all it’s free. If you’re ready to start using this free document to start converting units of weight, instead of taking the time and energy to do it yourself to accomplish a much larger goal, then download the free template today. Downloading the free Weight Conversion Template is as simple as clicking the link provided for you below. Next, you will begin to enter your own data into the required fields. The first and only step is to enter the information you need into the appropriate cells of the document. There are only two cells that require you to enter information. They are located to the far left of the table and are placed side-by-side. You will start by entering the unit of weight you need to be converted. In the pre-written text, you will start with “300 Pounds.” If you click on the first cell, a drop-down menu will appear, giving you multiple options to choose from. You would then just select the amount of weight you want to use, corresponding to the unit you have just chosen. In the example, the conversions across all different types of weight measurement are displayed on the right-hand side of the column. Looking at the example, the template converts 300 pounds to ounces, kilograms, grams, etc. 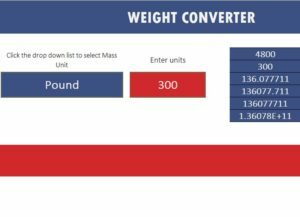 Using this template, you will be able to convert any unit of weight measurement to the one you need.